Details: CS5055PRW Features: -Built-in accessory storage. -Built-in light. -Carrying handle. -Light weight. -Needle threader. -Built-in thread cutter. Dimensions: Overall Height - Top to Bottom: -11.65". Overall Width - Side to Side: -16.26". Overall Depth - Front to Back: -7". 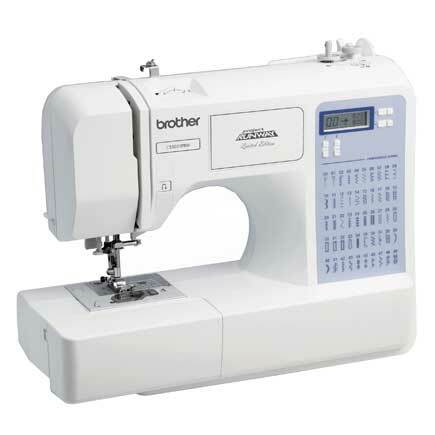 Create high-end fashions at an affordable price, with this incredibly easy to learn and use, exclusive Brother Project Runway computerized sewing machine. The CS5055PRW offers complete couture-level solutions to help you leverage your sense of style into one-of-a-kind, runway-ready fashions! 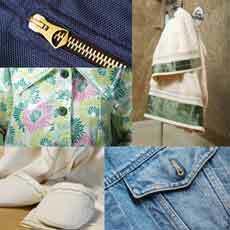 Experience easy, reliable threading of both top and bottom threads; virtually effortless sewing on a wide range of fabrics, and the ability to add professional quality buttonholes, zippers, decorative top stitching and neat, overcasting edges to your favorite creations. 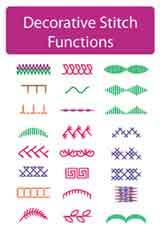 The CS5055PRW includes 50 built-in stitches that cover a wide range of utility, decorative, heirloom and quilting stitch functions, and your entire selection of built-in stitches is printed on the front your machine, for easy reference. 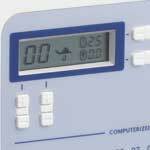 Simply select your desired stitch on the informative LCD display screen and adjust the stitch to your specific needs. And for truly custom results, choose from the 5 one step buttonhole styles that are actually custom-sized to fit your specific buttons! 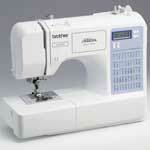 Includes 6 specialty sewing feet, complete bilingual English and Spanish instruction manual, and a 25-year limited warranty. With its small footprint, convenient carrying handle, and light weight, the CS5055PRW is perfect for carrying from room to room, and great for taking to classes. Simply choose your stitches with the intuitive push-button stitch selectors, then see your selection clearly displayed on the informative LCD display screen. 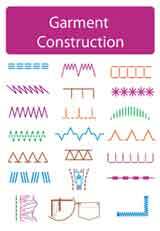 The display shows your selected stitch, the length and width of your stitch, and also guides you to the appropriate foot to use for each type of stitch. 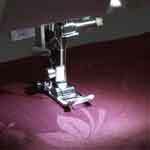 Just drop in your bobbin, pull the thread through the slot, and start sewing. 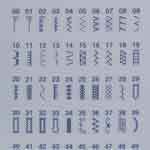 Give your next project a truly professional touch, with a row of neat, consistent buttonholes that show your attention to style. Typically found only more expensive machines, the vertical spool pin helps ensure more consistent feeding, especially for metallic and other specialty threads. 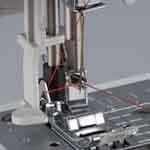 The CS5055PRW offers you not just a great selection of individual sewing feet and stitches – but complete solutions to give you that true designer edge. 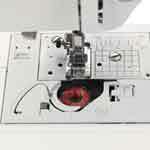 Use the included zipper foot and built-in zipper insertion stitch to help ensure neat, even stitching close to each edge. The special overcasting foot and overcasting stitch are designed to you give you a clean, serged-like edge, perfect for home dec and knit projects. Add that extra fine, custom touch to your work with the built-in decorative satin, scallop, checkerboard, or feather stitches. 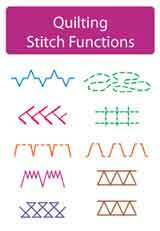 For even more creative options, use the included twin needle, and enjoy sewing two neat, parallel rows of your favorite stitches! 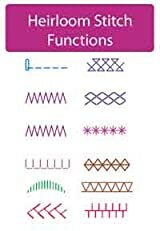 Easily create custom-sized buttonholes for standard and novelty buttons with the included buttonhole foot and 7 one-step buttonhole stitches. Clear markings on the buttonhole foot allow you to see the exact vertical and horizontal points that fit your unique button.